Screened in porches from SRA Home Products have been improving the outdoor living spaces of homes in Cherry Hill, New Jersey, since 1988. These products potentially increase the value and curb appeal of your home, and also provide you with additional living space that can be used in virtually endless ways. 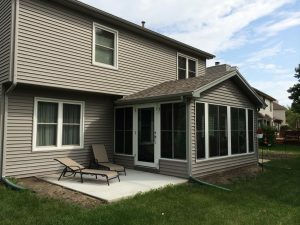 Whether you plan to have a hot tub installed in your screen room or would like to use it to host parties and gatherings, a screened in porch from SRA Home Products is sure to exceed all of your expectations. The screened in porches we offer are among the finest outdoor living products in the industry. Manufactured by TEMO, these structures have many impressive features that improve the lives of homeowners in Cherry Hill and beyond. For example, our enclosures have solid thermal roofs that deflect the sun’s heat, and removable vinyl sashes that block up to 99 percent of UV rays. These products also feature heavy-duty extruded aluminum construction that is coated with TEMO’s advanced TEMKOR surfacing, which provides exceptional durability and protects your screened in porch from damage. And, for added peace of mind, all of our screened in porches are backed by TEMO’s lifetime transferrable warranty, so you can trust that your investment will remain protected for decades to come. For more information regarding the benefits of the screened in porches available to homeowners in Cherry Hill, NJ, contact SRA Home Products today.